Returned to Juniata in 2002 after 17 years with Owens Corning, Advanced Glassfiber Yarns, PPG and Ziff-Davis Publishing, became VP for Enrollment in 2016. Rob came to Juniata in 1981 from Bucks County, Pennsylvania. 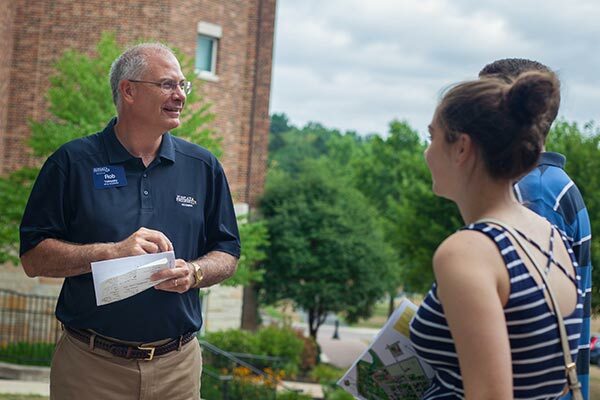 The personal nature of the Juniata educational experience, and the relationships students develop with their faculty and classmates are two aspects of why Rob has come to love Juniata and all that it does for students during their time at Juniata, and alumni throughout their lives. Rob has served the College as the Chief Information Officer, Chief Financial Officer and now VP for Enrollment and is a member of the Senior Leadership Team. He co-chaired the most recent strategic planning committee, was a member of the presidential search committee and the Juniata Middle States Planning Committee as well as serving on the Middle States visit teams at Hobart and William Smith and Manhattanville College. Rob teaches Behavioral Analysis of Organizations in the Accounting, Business and Economics department and also serves as a student advisor. Rob met his wife Jan at Juniata and they have been married for 31 years and have two children, Greg 22 and Charlotte 19. They reside in Huntingdon, just a short distance from the campus.